My pick for the best golf instructional book of 2011 is Unconscious Putting: Dave Stockton’s Guide to Unlocking Your Signature Stroke (Gotham Books.) 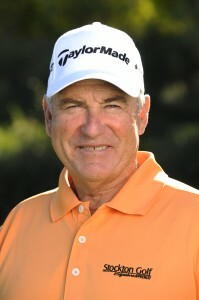 Two autumns ago, I said Stockton, a two-time PGA champion and former Ryder Cup captain, was the game’s teacher of the year after successfully re-tooling the putting routines of Phil Mickelson (who wrote the book’s foreword) and Michelle Wie, both of whom highly praised Stockton for working with them. This year, Stockton and his sons Ron and Dave Jr. (the nucleus of Stockton Golf) are again in the news for helping more than two dozen tour players including Rory McIlroy, Martin Laird, Justin Rose, Yani Tseng, Morgan Pressel and Suzann Pettersen. The winner of 11 tournaments on the PGA Tour and 14 wins on the Champions Tour, Stockton remains one of the game’s true gentlemen and ambassadors as well as one of its most insightful instructors. Recently, he spoke at length with me by phone. Here is the concluding Part II of our conversation. In the book, you draw a comparison between shooting pool and putting. Please explain. Playing pool and putting are very similar. They’re both hand-eye coordinated strokes. In pool, you don’t take the cue stick and practice strokes next to the cue ball looking at another ball. No, you take practice strokes right behind the cue ball. The putting regimen I recommend is coming in from behind it and then you letting it go. I don’t take a practice stroke next to the ball because it would distract me from focusing on the line. Too many golfers take practice strokes next to the ball while looking at the hole, then place the putter behind the ball and then jerk it back. It doesn’t make sense. When players line up putts with their eyes, their feet should be pointed along that line. If they start out mechanically, their feet will be too square to the cup not the line; that’s a big difference in aiming properly. The feet should follow the line, not the cup. In the book, you also talk about how players must get themselves out of negative self-talk. How do golfers break out of it? Well, the way to break out of it is to have a good game plan. For example, when you’re faced with a chip, you have to decide first whether you’re going low or high at the pin. Now Mickelson may say it would be 80% high and 20% low but my approach would be just the opposite, 80% low and 20% high. To me, it’s easier to visualize and hit a low shot. So the first question is really: what kind of shot do you want to hit? Not necessarily what club you are going to use but what kind of shot are you going to hit? And in terms of a chip shot, you have to visualize where you’re going to land it on the green and then how it will roll to the hole. Most people miss the simple fact of visualizing first where to land the chip. It’s the same with putting. You have to visualize the putt going in first and foremost by studying its projected path. What players do you like to watch putt and why? Steve Stricker. He just rolls the ball perfectly with such a soft touch. He stands close to the ball, as I do, and he looks very, very comfortable. And I admire Brad Faxon’s stroke. His game was lot like mine; we both had to putt well to make it out there because the other parts of our game were not as strong. I believe Rory’s (McIlroy) putting is right there with those guys in terms of putting. That’s why I enjoy what we do here at Stockton Golf. We know that if we work successfully with such players as McIlroy, Suzann Pettersen or Yani Tseng and if their short games improve it can lead to tremendous results because the rest of their game is so good. You probably read that during the recent Senior Amateur championship competitor Vinny Giles, a long putter user and former champion, called the USGA “gutless” for not banning anchored putters. Your reaction? Yes, it caught my attention knowing how close Vinny is to the USGA. But again I don’t see the USGA banning them. Can you really see it telling Freddie Couples or Bernhard Langer they can no longer putt with them? But regardless of how the USGA rules or doesn’t rule, putting is still all about routine. Can you read the green? Do you have a routine that relaxes you to stroke the putt and just let it happen? The physical act of putting is less important than the process of putting and that’s what I’ve tried to describe in my book. Recently, I read where you helped LPGA star Yani Tseng with not only her putting but also with her post-round speeches. Please elaborate. I thought it was important for Yani, a wonderful young lady, to be better at her acceptance speeches. So I literally would stand in front of her and fire questions at her as if she were standing at a podium. She was very nervous at first but it was a good learning experience for her. I wanted her to realize that when she won these tournaments it was important for her to express herself and be able to thank the right people in the right way. So Yani and I worked on her speeches for over a year and a half. She’s taking English classes and her English has improved tremendously. Of course, when you’re winning as much as she is you get pretty good at speaking in public because you’re doing it more often. She’s now a great interview and always smiling. I take a lot of pride to see how far Yani has come. She realizes how much her remarks can mean to tournament officials and volunteers who may have spent over a year on a tournament. She knows you should leave something positive for these people and let them know you appreciated all their efforts. Why do many Tour players struggle with this aspect of winning? There are a lot of people in the golf business that when they get good can’t handle the pressure of all of the attention. That’s why I’m also proud of how well Rory handled the media and the attention he received after his final round 80 at the Masters. He dealt with it with so much class. On a scale of one to ten, it was a twelve whereas Tiger Woods’ remarks afterwards—who shouldn’t have been upset about anything–were like a minus four. And so when Rory won the Open he turned out to be a fan favorite because of the way he handled himself at the Masters as well as how he treated the gallery and press at Congressional. I mean, the Open gallery almost saw him as an American. What’s your advice on working with junior golfers? First, have fun. They should practice with just one or two balls on the putting green and putt them all over the green. Don’t have them putt to just one hole and don’t get them into a lot of drills. Have them learn to putt by feel.